Restaurant Amusé opened in 2007 and it’s remained on the Gourmet Traveller Top 100 list for some years now so it was time I finally went. As you pull up outside, you wonder if you’re in the right place. It looks like a suburban house, and it’s only when you look closer that you see the ‘Restaurant Amusé’ wording to the left of the front door. And yes, it is ‘homey’ – owners Hadleigh and Carolynne Troy used to actually live on the premises and they wanted a restaurant where people felt like they were a guest in their home. The first thing we noticed on walking in – it’s dark. We all commented on how dim the lighting was as we were having trouble reading the wine list. My immediate concern was every food blogger’s nightmare… Oh no, my photos are going to be terrible! The menu changes with the season and is degustation only at $130. Not a bad price considering you often see degustations of a similar quality for $160-$180. One copy of the small paper menu is sitting face down on the table – it’s up to you whether or not you want to look at it, or resist the urge and enjoy the surprise. I lasted all of eight seconds before I picked it up and turned it over. Yes, I’m hopeless. We start with ‘snacks’ – Curried egg on baby cos leaves, salt and vinegar cracker, and cheese puffs. I loved the crispness of the cos, the crunch of the cracker and the cheesiness of the puffs. Off to a good start. What came next was a small cup of Onion soup with pickled shallots and interestingly, tapioca pearls. The flavour of the soup was nicely concentrated and the texture of the tapioca further differentiated it from a normal bowl of onion soup. The first course is something a little different – three purees on a plate – Mushroom, sunflower and cauliflower – so simply served as 3 blobs on a plate, almost merging together. Simple presentation, but there was certainly nothing lacking in terms of flavour – we all really enjoyed this dish. I must make mention of the house made bread. The only time I eat bread is when I’m out and it’s brought to the table. No, I’m not a low-carb freak, I’m just not a bread fan. But if you can’t get good bread at a Top 100 restaurant, where can you? This next dish was Marron with carrot and buckwheat. As with the purees, this dish was presented really differently. What arrived did not resemble any marron dish I’d been served before. The question that immediately sprang to mind is “where’s my marron?” but when you dig in, you find big chunks of marron hiding under the thick carrot bisque. 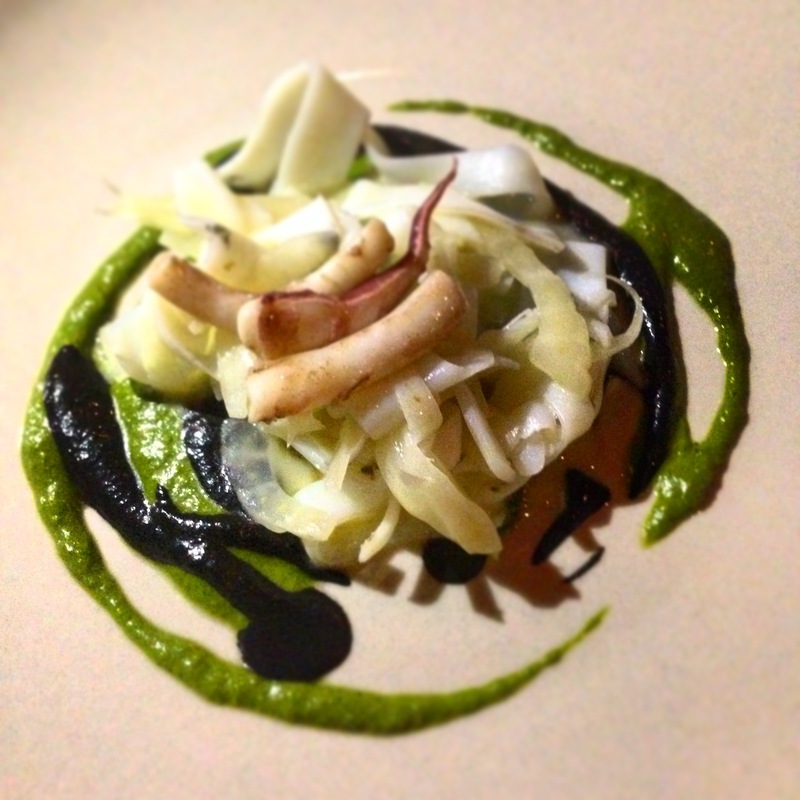 I really liked the next course – Cuttlefish, fennel and black garlic. In summary, it looked good and tasted good. I’m a big fan of cuttlefish and the combination with the fennel and one of my favourite things, black garlic, was well balanced. Following this, Beef, apple and coal. I was hankering for something meaty, and this did the trick. The beef is charred on the wood grill, diced and finished with coal oil (made by infusing the coal from the wood grill in grape seed oil), capers and cornichons – all sitting on a wholegrain mustard mayo. For me, the winning course of the night was the Duck, artichoke and orange. A generous amount of duck with more duck in crunchy brik pastry, with a Jerusalem artichoke puree. Flavour everywhere! And then, the optional truffle course – who can pass up an optional truffle course? Truffle Rice Cream – topped with a satisfying amount of freshly shaved black truffle. Delicious. Onto the sweet stuff – Passionfruit gel, coconut and pine geranium on a crispy cracker followed by the Brown butter, honey and buttermilk which takes the form of cake with ice cream. I really liked it – not too sweet. The accompanying Mint and pepperberry infusion tea was refreshing and doubled as a really good stomach settler after a massive dinner. Given the lighting, the photos I took on the night were so dark and grainy, I contacted Carolynne at Amusé and asked if she would be so kind to take some photos to replace my shabby ones. She was more than happy to oblige, and I’m grateful that I can show the food in a better light, literally! So, most of the pics below are compliments of Amusé. I was really impressed with Restaurant Amusé. A quality dining experience with great food and service. All up, a mighty fine degustation and unquestionably Top 100 worthy. Best bread I’ve ever eaten.